Note: unless you purchase a Combo deal, the standard feeder comes with the special "Moisture Trap™" funnel and the power adapter--The remote timer is extra, or you can use any timer already in your possession. The base model holds 3/4 cup of flakes and or pellets, which can be increased with its supplied 2-cup hopper extension for your extended absence or if you have large fish. You can even buy additional extensions or other accessories to make it a cat feeder, pond feeder, or anything else, if you do away with your aquarium! The special "Moisture Trap™" funnel effectively keeps excessive moisture away from the feeder's food reservoir, as well as providing a means of distributing the food without spills. The feeder comes with a low voltage power adapter that can be plugged into any 24-Hr lamp timer already in your possession (we also sell them), digital timer (for precise timing), or even a home automation power module. 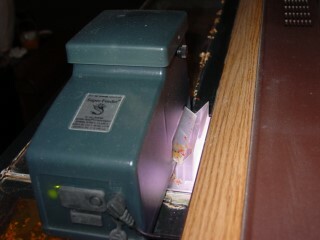 Some people operate it with a remote control to manually feed the fish or you can even use a "Clapper®" light switch to do this. Of course, it has its own internal ELECTRONIC adjustable feed timer and VOLUME ADJUSTMENT to accurately adjust the amount of food you want dispensed per cycle (it drops the food all at once for the amount of time you selected). Base model is 7" long x 3 1/4" wide x 4 7/8" tall. The hopper extension is 3.9" tall. This feeder can also be easily adapted to feed caged animal like rabbits, guinea pigs, birds, etc...by placing the feeder outside the cage and setting up a guttering system to deliver the food. Lots of suitable applications. For outdoors, you may also use the KSF-2 Koi-Pond feeder which has a cover over the chute and mounting hardware, and for indoors, the CSF-3 Cat/Small animal Super Feeder is also well suited. ASF-1 is shown above on top of glass cover in front of light fixture. A piece of the rubber hinge between the glass panels has been removed, through which the neck of our funnel protrudes (patented funneling system). 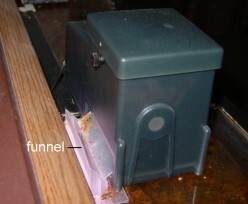 The feeder's distribution slide is then placed next to the funnel. Moisture cannot go directly into the feeder with its special side-chute, unlike most models with a chute underneath the feeder. For flake food, the funnel's larger end should protrude into the water level, thereby locking out moisture trapped between water and glass cover. Copyright © Super-Feed Enterprise. All rights reserved. Revised: September 30, 2016 .